Rev. Father Christian “Chris” Soeterboek passed away very peacefully on January 29, 2019 at Salem Home, Winkler with his friend JoAnne Oswald at his side. Fr. Chris was 91 years old. Father Chris was born on June 30, 1927, in Bakel, Netherlands. He was predeceased by his parents; his brother Father Laurentius Soeterboek; and his four sisters. All gave their life to God and joined the religious life as priests and nuns. Left to mourn are his dear friends (his adopted family) Ken and JoAnne Oswald, Shawn and Joel Oswald and their children Lane and Riley; Karl and Shelly McKenzie (nee Oswald) and their two children Sydney and Ayden; Shannon Campbell (nee Oswald) and her children Chelsey, Heidi and Katelyn. Fr. Chris left home at the young age of 10 and entered the youth seminary. Prior to this, his oldest sister had basically raised him, because their mother had become very sick and was bedridden. During World War II, when the seminary was closed, he worked undercover carrying messages back and forth on his bicycle. They never suspected anything. Fr. Chris immigrated to Canada in 1949. After completing his seminary formation at St Peter’s Seminary in London, Ont, Fr. Chris was ordained to the Priesthood on June 4, 1955, in St. Mary’s Cathedral. Fr. 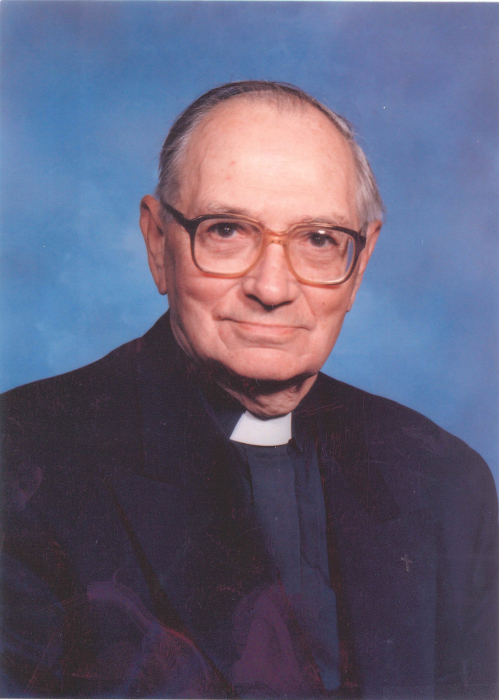 Chris served as a priest of the Archdiocese of Winnipeg for over 63 years including: Parochial Vicar of St. Edward’s in Winnipeg (1956-1960), (during part of this time he was also the Diocesan director of sodalities), Chaplain of Fort Churchill (1960-1961), Administrator of St. John’s Parish in Portage la Prairie (1961), Parochial Vicar of St. Edward’s Parish in Winnipeg (1961-1962), Pastor of St. Theresa’s Parish in Plumas (with attached missions) (1962-1967), Pastor of Corpus Christi Parish in Winnipegosis (1967-1971), Parochial Vicar of St. Edward’s Parish in Winnipeg (1971-1972), Pastor of St. Joseph the Worker Parish in Russell (1972-1974), Pastor of St. John’s Parish in Portage la Prairie (1974-1981), Pastor of Sacred Heart Parish in Virden (with attached missions) (1981-1983), Pastor of St. Viator’s Parish in Dauphin (1983-1989), Pastor of St. Dominic’s in Neepawa (with attached missions) (1989-1992), Pastor of Our Lady of Seven Sorrows Parish in Camperville (with attached missions) (1992-1995), Parochial Vicar of St. Augustine of Canterbury Parish in Brandon (1995-1997). In addition to these parish responsibilities, Fr. Chris served as a Judge in the Regina Regional Marriage Tribunal for many years and as Dean of the Dauphin Deanery. As well, he served as Spiritual Director of the Diocesan C.W.L for several years. While Fr. Chris retired from active ministry in 1997, he continued to replace in parishes in the Westman deanery, including a brief period as Parochial Administrator of St. Dominic’s Parish in Neepawa, and as Sacramental Minister of St. Jude’s Parish in Erickson (with attached missions). Fr. Chris was a simple, gentle, humble, kind, loving and compassionate person. He was the rock, the pillar of strength in each community he worked in. Fr. Chris touched many lives throughout his years, whether it was hearing confessions, performing baptisms, marriages, visiting and anointing the sick, and burials. Fr. Chris always brought comfort and peace to those he helped in his simple, but calm and loving way. He was doing the Lord’s work! Many times, he went beyond the call of duty, which caused him to suffer with many health issues. One of his interests was fishing! We heard many a fish take. Especially the one about how long it took him to bring in a 32 lb Jack and the fight it gave him. He was also great with his hands. There was nothing he couldn’t take apart and repair, whether it was watches, clocks, vehicles, or machinery. His hands were so steady! Now, Fr. Chris has been called home to our Lord and waiting for the last day, when he will be raised up! Fr. Chris has already been missed and we will love him and miss him forever! Rest in peace our dear friend! You deserve it!